Sources close to us report Staal will be out 7-10 days. 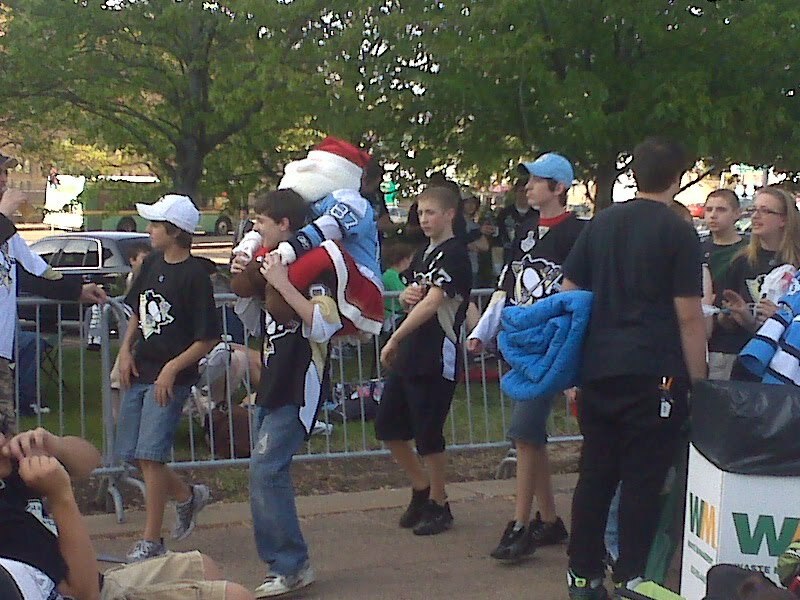 Pens Universe was reporting from the Lawn last night. Caught up in the playoff atmosphere amongst 7,000 people outside and a standing room only sell out of 17,132 inside. Even Santa Clause was there! But I’ll be completely honest with you, I was nervous. 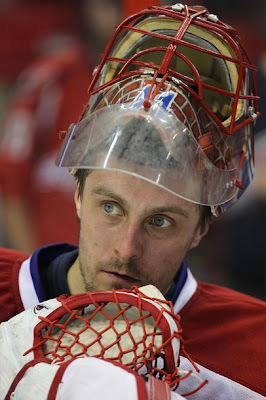 After watching Halak work his magic against the Caps and thinking, “Gee I hope we don’t come out slow after being off for almost a week”. Well the Pens proved me wrong. The beginning of the first period was a little shaky, PK Subban opened up the scoring with his first career NHL goal to put the Habs up 1-0. An odd bounce that pin balled past Fleury. It didn’t take long for the Pens to get into form. Brian Gionta takes a tripping penalty putting the Pens on the PP. The PP looked awesome, the puck possession was crazy, best we’ve seen all year and it paid off. Tape to tape passing between Letang and Geno and then finally to Gonch who preform laser surgery on Halak. 1-1. 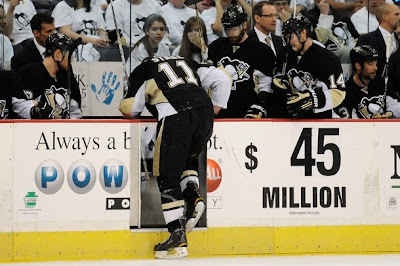 About 5 minutes later the Pens go back on the PP thanks to Travis Moen. With the second PP unit on Jordan Staal roof one with about 19 second left. A nice little centering pass from Poni allows Staalsy to get between the circles and take the shot. 1-2 Good Guys. . The Pens ended the first period very strong. I felt a little better going into the second even if it was only a 1 goal lead. 2 minutes into the second period, the Pens get their 3rd PP chance. Gionta lost his mind and threw the puck into outerspace. Letang took advantage of that and threw a shot at Halak similar to Staalsy. 1-3. The power play is now 3 for 3. Yes you heard me right 3 for 3!. Mike Cammalleri pulls the Habs within one after a good offensive zone push, Fleury was screened by his own dman and winger and the puck squirted around them. 2-3. Flower was a beautiful save on a streaking Tom Pyatt to keep the Pens ahead. The third line of Pascal Dupuis, Matt Cooke and Craig Adams caught the Habs in a line change. Beautiful passing lead to a beautiful goal from Craig Adams and according the Versus the goal was descriped as, “Ohh that’s hockey!” 2-4 from Dupes and Cookie. Flower continued to look strong in goal as the Pens finished the 2nd with a 2 goal lead. The start of the third was no different. 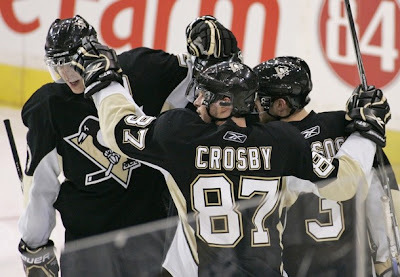 The Pens go on their 4th power play and Sid and Goose pull off the old Ryan Whitney back door play. A nice cross ice pass to Goose creeping in the back door. 2-5. Oh no, what’s this Halak being pulled? Price now in. The Habs get a chance on the PP and cash in on it. 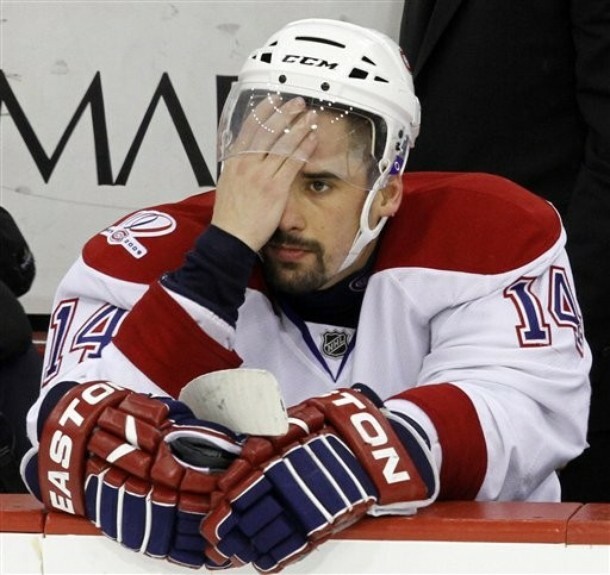 Brian Gionta, who was the best guy on the ice for the Habs last night, slaps a one timer from the point past Fleury. 3-5. Finally Dad ends the Habs misery with an empty net goal to seal the deal 3-6. Seems Halak isn't as special as we all thought. After letting 5 goals in and being replaced by Price it was clear he wasn't used the offensive system employed by Dan Bylsma. In Damian's pre-series article he discussed the differences between the Capitals and the Penguins. In short, the Pens simply create better scoring chances despite not putting up the shots that Washington does. "The Pens' dominance can be traced back to their ability to open up shooting lanes with constant movement, quick passes and almost constantly changing their shooting angles." This is something the Capitals just don't do very well. Jordan Staal: We all saw last night when Jordan Staal pulled himself off the ice after colliding with PK Subban. He did not return to the game after that incident and well reports this morning from TSN and RDS is that Staalsy is done for the season due to a sliced tendon. He went into surgery last night after reportedly leaving the game on crutches. Defense helps out offense: 3 Dmen scored, all on the powerplay. "Staal is not out for the remainder of the playoffs. Had a procedure to repair a cut."